Amiciness is back to discuss Riverdale 1×05 Heart of Darkness. This episode is not as much of a rollercoaster ride as the last episode (thank God!) but the show still manages to surprise. As usual,❗SPOILER ALERT❗ if you haven’t watched the episode. The central event this episode is Jason Blossom’s funeral. The Blossoms invite all of Riverdale to Thornhill, the Blossoms’ estate! It’s not because the Blossoms are particularly well-loved in the community, but it’s Mommy and Daddy Blossom’s ruse to find out who might be Jason’s killer. Everyone is sure that the killer is just roaming around Riverdale, in plain sight. Oh and the Blossom mansion is so huge that they have their own graveyard, where Jason’s body will be buried! It’s hard to grieve for his death as we really do not know anything about him until now. Jason hasn’t even had a speaking line yet. Good thing, this episode, we find out Jason’s more human side through Cheryl and her family. Cheryl invites Veronica over to her house for a sleepover the night before the funeral. At dinner, we meet Mommy and Daddy Blossom, and my new fave, the kinda creepy Granny Blossom. Cheryl has been taking Jason’s death pretty bad. Not to mention her mother blames her for “rowing him to his death” and causing humiliation to the Blossom name. To make matters worse, Cheryl isn’t allowed to say anything in Jason’s eulogy. Aww…glad that she found a new bestie in Veronica. But that doesn’t stop Queen Cheryl! She walks up to the funeral in her all-white dress, the one she wore when she last saw Jason. (It’s all in slow-motion, soundtracked by a dramatic cover of Tears for Fear’s “Shout” by Think Up Anger featuring Malia J.) She beelines to the podium to make her speech. She says that Jason always protected her. When they were young, Cheryl insisted that they had separate birthday parties, even though they’re twins. Until one year, Jason convinced her to hold a joint birthday party instead, because no one wanted to come to Cheryl’s. #thefeels I almost cried during this scene. Maybe, Jason is not as bad as we think or as Mommy and Daddy Cooper think. At the very least, he was a good brother to Cheryl. Archie is on a roll in this episode. He decides that he is a multi-faceted man who can be a character from both Friday Night Lights and Glee. Football can get him a scholarship to a good college where he can study music. Win-win situation for Archie and his dad, emirayt? I guess, this doesn’t motivate him enough to actually do well in the field. This leaves Coach Clayton no choice but to give Archie a competition for the most coveted position, Riverdale’s. Next. Top. Captain. Chos! I meant, captain of the Riverdale Bulldogs and heir to Jason Blossom’s jersey. But of course music is his passion, and here comes Valerie snooping in to help. We get to know Valerie more than just being one-third of Josie and the Pussycats. (Although I don’t really like her. Get away from mah man!) She recommends a music coach, Mr. Castillo, to Archie because she’s such a flirt. In fairness to her, she was able to teach Archie how to write his songs on sheet music overnight. But just after a couple of meetings, Mr. Castillo shuts down Archie’s dream making him think whether Ms. Grundy was just playing his instrument and not listening to his music. If ya know what i mean? 😏 HAHA. Too soon? Too creepy? Sorreh. Speaking of Archie with creepy women, at the funeral, Archie retires Jason Blossom’s jersey and returns it to Mommy Blossom. Mommy Blossom sees the uncanny resemblance of Archie to Jason (because they’re both redheads, duh). And then proceeds to touch caress his hair… in the creepiest of ways. Betty and Jughead are still working on their investigation into Jason Blossom’s murder mystery. I’m not entirely sure if that’s all they write about for the Blue & Gold. They’re in too deep now that they decide to go to the funeral with the ulterior motive of looking for clues in the Blossom mansion. Betty and Jughead go all Veronica Mars snooping in his room. They don’t actually discover anything. Luckily, Granny Blossom is creepily hiding in the dark, which startles both B & J. Granny Blossom mistakes Betty as Polly (it’s her wonky eyes) and she reveals that Jason and Polly were… “engaged? !” Betty completes Granny’s statement, almost in tears. In fact, Granny B. has given her the ring, a Blossom family heirloom, which may or may not have magic powers. But let’s be real, it’s probably magical (dark magic to be specific). Juggie, I feel like I don’t even know who my mom and dad are anymore. We’re finally meeting Polly! Josie is plotting her revenge against Archerie (Valerie + Archie, a.k.a. “Ginger Judas” 😂). I love how the title card this episode was seamlessly inserted in between scenes, with the theme music slowly swelling for dramatic effect. I can’t help but associate Hal Cooper, Betty’s dad, with the actor’s previous roles. I remember Lochlyn Munro from the original Scary Movie and White Chicks. Veronica: What about you, Archie? How’s life in the PG world? Veronica: Post Grundy? [pause] What, too soon? Valerie: I know Ms. Grundy was tutoring you. Veronica: Understatement of the year. Well of course Archie (K.J. Apa) is shirtless again… for no clear reason. 😂 Archie is boxing without a shirt on… as training for football. Even Archie’s dad is confused about it (the boxing, not the shirtlessness). But here at SAT, we’re all for it. 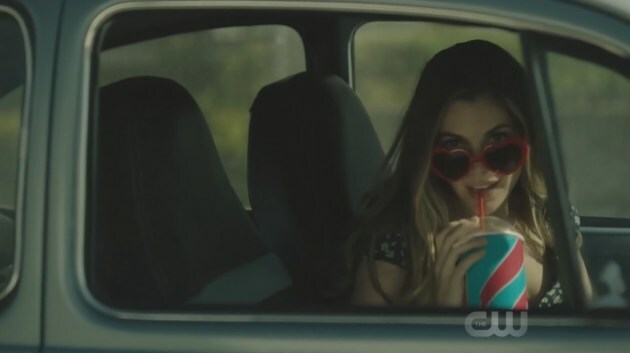 What did you think of Riverdale 1×05? Did you suspect that Betty’s dad could be Jason Blossom’s killer? What do you think really happened to Polly? Sound off in the comments below. Previous post:Fujifilm X-A3: To buy or not to buy?